Who Is the Workshop For ? Who Has Attended ShoeShool ? What are the Requirement of Participants ? What are the Fees and What Do they Include ? What Do the Students Say about the Workshops ? When are the Workshops Scheduled ? When are the Advanced Classes ? What types of Tools & Equipment will I be using at ShoeSchool ? How Do I Order Shoe Lasts ? Where is ShoeSchool Located ? Company Executives from non-shoemaking backgrounds who need a basic appreciation of footwear design and construction techniques. Sales and design staff who could make use of practical skills and knowledge. Staff in retail and distribution centers who need a basic understanding of the process and technology of shoemaking. New entrants to the footwear industry who need an introduction to the technology and process. Medical professionals working in related fields such as Podiatry, Sports Medicine, Physical Therapy, Chiropractic. Students in fashion design and retail merchandising can benefit from a basic knowledge of footwear manufacturing techniques. Anyone interested in gaining first hand experience in designing and hand crafting a pair of shoes from start to finish. Who Has Attended ShoeSchool ? No prior experience of any kind is required to participate in the "Introduction to Shoemaking"
"Introduction to the Business of Shoemaking". Advanced programs require a basic working knowledge of footwear construction, or apparel design, or successful completion of the "Introduction to Shoemaking". Each individual that comes to the workshop will bring with them various skills and experience of design and hand crafting in many mediums such as fibers, wood, metal or leather. During the workshop sessions we will have ample opportunity to share and exchange the ideas, special skills and experiences that each student brings with them. The "Introduction to Shoemaking" programs are designed to give a basic overview of the entire process of hand crafting footwear from concept to completion, and to have a positive and fun experience making shoes. The most important requirement is a positive attitude, and the understanding that, during a few days in the workshop is a very limited time to develop all the skills required to make perfectly hand crafted footwear. The shoes you make during to workshop will be made to fit your own feet. They will be a classic shoe pattern that will give you a solid foundation to explore your own creative designs in the future. The objective of the workshop is to concentrate on the subject matter being taught, as well as successfully completing all the operations for this first pair of shoes, on your own. When you leave you take the knowledge, the personal experience and your completed shoes with you. When you need assistance a staff member will be there to help. Hotel, Meals & Transportation are Not Included with This Program or the Advanced Workshops. "I have a new appreciation of the complexity of footwear and in particular- custom shoes." "Excellent Course Layout and execution." "The atmosphere was positive and easy going, which makes a good environment for learning." "Excellent Course, I learned a lot of useful information for my job." "At long last my website is up and running. These last few months have been busier than I thought possible; wholesale orders are growing, retail orders by word of mouth are growing, and soon I hope the Internet sales will keep me even busier." "I just wanted to thank you again for all your help in getting me started in the shoe industry." "I am extremely grateful for all the information you generously provided and will never forget how you have changed my life." "Enjoyed the Last Resort ! " "I gained more than a fundamental understanding of shoemaking... key factors on fit and the foot, too ! " "Work ? I thought this was Art...."
"Shoes and Salmon, The Best ! " When Are the Introductory Workshops Scheduled ? "The Introduction to Shoemaking" 5 Day Workshop is offered 3-4 Times each year. We will add extra sessions when these programs are filled. "The Introduction to the Business of Shoemaking"
3 Day Workshop is a Private Consulting Program that is offered several times each year. This program is Customized to the Project of the Individual, and can be scheduled to take place at a mutually convenient time. are Private Consulting Programs that are Customized to the Project of the Individual, and can be scheduled to take place at a mutually convenient time. Go to the Registration Page and Download an Application for the Workshop or Program you would like to attend. Contact ShoeSchool to confirm the Fees and Dates for your program. Fill out the Application, sign and send it along with your deposit to ShoeSchool. Upon receipt of the Application and Deposit ShoeSchool will reserve the facilities. Basic Hand Tools will be used by the Students to design and make a complete pair of shoes. 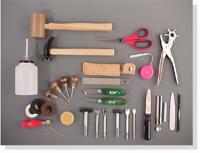 The use of a complete hand tool kit is included with the Lab Fee for the workshop. With a detailed list of tools and suppliers the student can return home, purchase the tools of their choice and continue forward with their shoemaking projects. There will be demonstrations of the specialized equipment at ShoeSchool. Students will have the opportunity to see how each machine is used in the Shoemaking Process. Before you can operate a machine you need to understand how to perform the same task using hand tools. "Introduction to the Business of Shoemaking"
The focus of this program is the Business Aspects of Shoemaking. You will observe a Master Craftsman making a shoe from start to finish, using Hand Tools & Machines, including demonstrations of specialized equipment required in the Shoemaking Process. This program is designed for the individual that would like to learn to operate and maintain the specialized sewing and other machines used for Leather Craft, Shoemaking and Shoe Repair. You can purchase a CD Digital Publication "Developing Shoe Last Collections". The First Section of the publication covers all the basic information you will need to understand, before you can purchase shoe lasts, no matter where you may choose to buy them. ShoeSchool is located in Port Townsend, Washington, on the scenic Olympic Peninsula, approximately 2 hours from Seattle. Port Townsend is a Victorian Seaport Village on the Puget Sound, surrounded by spectacular mountain and water views. The Victorian Architecture is a popular tourist attraction, with many bed & breakfast inns, interesting galleries and restaurants. Many people that come to ShoeSchool take advantage of the opportunity to make an adventure of their trip to Washington by shopping in Seattle, visiting the Olympic Rain Forest, or taking a Ferry to Victoria B.C. For complete details concerning Travel and Accommodations in Port Townsend and the Olympic Peninsula, go to Links & Resources. The preservation, sharing, and furthering of the knowledge and skills related to the Ancient Art & Craft of Handmade Footwear. Providing a forum for the exchange of ideas and a vehicle for learning the skills required, from Masters of the Trade. In the Modern World we face the issues of limited resources, while sustaining the environment with the products we design and produce. Re-Cycling, Re-Use and Re-Manufacturing, will be major factors in the business successes of the future. Ancient Techniques and Modern Technology can mutually benefit each other when properly balanced and applied.